List Rules Vote up the most endearing and funny stories from this Hollywood couple. It's hard to imagine where the gay rights movement in America would be without Ellen DeGeneres. She has embraced who she is and who she loves and she encourages others to do the same. Her self-acceptance has rocked the nation. A delightful byproduct of her pioneering work is that we have no shortage of adorable stories about Ellen DeGeneres and Portia de Rossi. In a way, the beautiful celebrity couple have become the country's unofficial first ladies. With their grand displays of affection and subtle loving glances, DeGeneres and de Rossi seem to have it all. Many people in Hollywood don't have the greatest track record when it comes to marriage. The stress of life in the spotlight can completely ravage even the strongest of bonds. For these two blonde bombshells, that is not the case. We can all probably take a lesson from their love playbook. Simply put, Portia de Rossi and Ellen DeGeneres are the best. Keep reading if you'd like a little inspiration. Anyone who has watched The Ellen Show knows that the fun host absolutely loves a good prank. Not even the sanctity of her marriage is spared. Both DeGeneres and de Rossi seem to get quite the kick out of tricking one another. 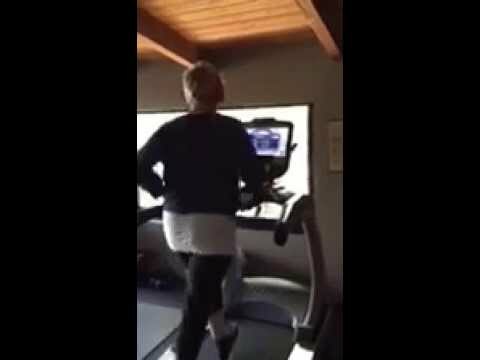 A couple of years back, DeGeneres stealthily recorded her wife doing the Jane Fonda Workout. To get back at her, de Rossi secretly recorded her love singing along to "Uptown Funk" during a treadmill run. Even during workouts, they manage to have fun. "I cannot imagine not going home to animals... They are the closest thing to God. They don't harbor resentment. Somebody put it really well: If you hurt a dog, the dog may, years later, remember you hurt him if he sees you. But he's not going to spend all those years planning how to hurt you the next time he sees you. The compassion I have for animals is from the earliest memories I have." Throughout their relationship, DeGeneres and de Rossi have posted many sweet messages to each other on their respective social media accounts. For their ninth wedding anniversary, Ellen wrote, "@PortiadeRossi and I got married 9 years ago today. Being her wife is the greatest thing I am." Portia responded, "We've been together so long that not only do we look like kids in this picture, but it was taken with a camera! Happy 9th, Thing." Ellen DeGeneres knows that seeing something new or different is the first step to accepting it. Not everyone completely understood her relationship with Portia de Rossi but the more that those people saw the couple together, the more they realized how normal love is. To this end, DeGeneres has never been afraid to be affectionate with her partner in public. Her PDA with de Rossi is infused with love and mutual respect.